If you find yourself in the unfortunate position of being unemployed and the thought of 'work experience' with a large supermarket chain is not the most appealing of ideas, then a little 'out of the box' thinking might be what you need. With tremendous competition for almost any job, employers are always looking for those who 'stand out from the crowd' and have shown commitment and enthusiasm which might make them a better than average employee. One of the ways of demonstrating this is to volunteer as a marshal at a motor racing circuit, such as Castle Combe near Chippenham. Adrian Fawdington, Chairman of the Castle Combe Racing Club, which runs the car race meetings at Castle Combe explained, "Marshalling is one of the most exciting voluntary occupations, especially for young people who are out of work or cash strapped. It could help you get a job, because employers are always impressed with those who make an effort to broaden their horizons and can prove they are able to make a commitment to a worthwhile activity. One of the criteria for applications to the Police or the Forces is proof of a person's involvement with the community or some other voluntary organisation. Some of the skills you can acquire can also prove very useful to an employer, such as Health and Safety, First Aid, Fire fighting, logistics, dealing with the public and so on." 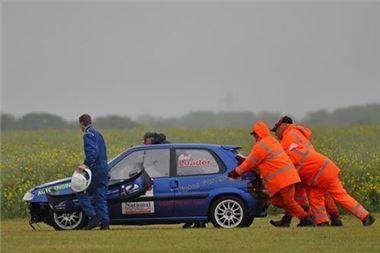 Adrian added, "How to go about this is covered at Castle Combe's annual 'Marshals Training Day' on Sunday March 11, where we will give you an insight into the training provided and the skills which can be learnt. It's an ideal day for someone who has never marshalled before to see if they might like it. It's free, there's no obligation and it could change your life. And with financial pressures very much on peoples' minds, this is an interesting way to fill your leisure time at no cost." As well acquiring new skills and increasing a person's desirability on the job market, marshalling allows men and women to get close to the action, and make new friends in a welcoming and exciting environment. Any fit and healthy person over 18 can take part in the Training Day. Just turn up at the circuit from 7:00 am. No special equipment is needed, apart from warm outdoor clothing. Refreshments are provided. The event takes place in the Wiltshire College building, just inside the entrance to the Westway car park and runs until 17-00. Further information can be obtained from Adrian Fawdington via email on afawdington@hotmail.com or by phone on 01666 823754.